Weddings are a time of celebration and love, so take the time to show that special couple how much you care. This summer, let Memorable Gifts guide you through this season’s unique wedding gift ideas. We have an amazing array of wedding gifts to offer congratulations and well wishes to the happy couple! Share whimsy and romance with this heart-shaped rattan and bamboo basket, filled with all the amenities for a sentimental picnic. 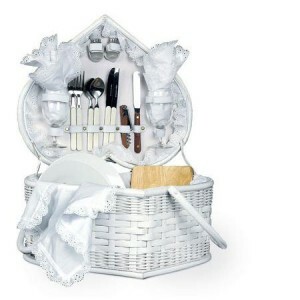 This adorable wedding heart picnic basket offers everything from wine glasses and cutlery to the tablecloth! This clever gift is sure to be the talk of the wedding! 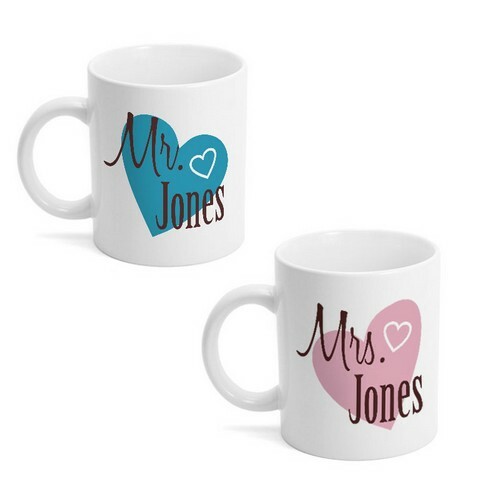 One of the perks of being newlyweds is enjoying the titles of Mr. and Mrs. Give your favorite couple the joy of seeing their married names in print with this adorable personalized matching mug set. Each mug holds 11 ounces, and makes a unique and customized wedding gift! 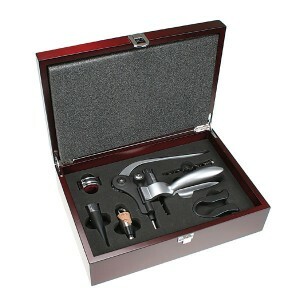 The ideal romantic gift for the couple that loves wine is our premium rosewood wine lovers gift set. This practical yet luxurious gift offers all the makings for a successful dinner party or wine tasting, with corkscrews, cutter, stopper, pour stopper and collar. Add a personal touch with the couples name and wedding date, or a special message with laser engraving on the outside lid. The greatest wedding memories are revived with photos of the special day, so help the newlyweds along with this classic silver wedding frame. This classic frame holds one 8″ by 10″ wedding portrait, and can be customized with the couple’s name and wedding date. Every wedding celebration has its share of toasts to the happy couple, and every happy couple deserves distinct and elegant toasting glasses. 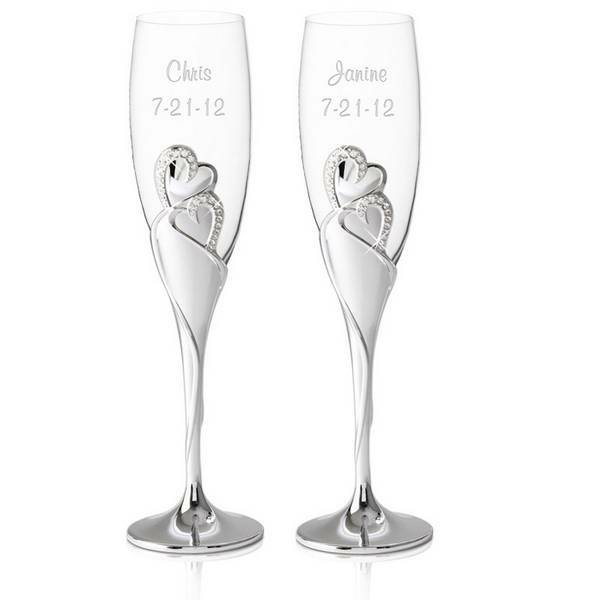 This crystal pair features silver-plated stems with heart embellishments, and room for engraving the bride and groom’s names and wedding date. A traditional and elegant wedding gift can be found with this marriage certificate holder and accompanying stand. 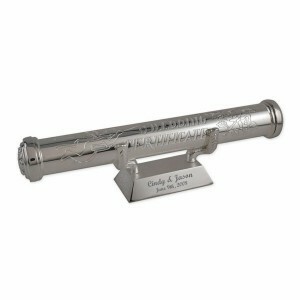 This silver finished 8 ¾” by 2 ¼” holder ensures the marriage certificate is safe and secure. Personalize the holder with the couple’s name and wedding date for a sentimental touch. 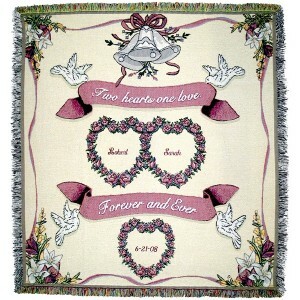 Help the bride and groom celebrate the joining of their two hearts with this heart to heart tapestry wedding throw. This sweet and time-honored wedding present allows for personalization with the couple’s individual names to be stitched into a heart, along with the wedding date. As summer wedding invitations make their way to your mailbox, look to Memorable Gifts for a truly unique and personal wedding gift. Our selection of traditional and modern wedding presents offers you the opportunity to connect with the bride and groom and pay tribute to their wedding day.